Bujumbura (pronounced /ˌbuːdʒəmˈbuːrə/) is the largest city, and the administrative, communications, and economic center of Burundi. Bujumbura is the capital city of a country that is geographically isolated, facing population pressures, with scarce resources. Once a German colony, and later controlled by Belgium, Burundi’s push for independence was exacerbated by violence between the Hutu and Tutsi tribes, which escalated to genocide. Years of inter-tribal violence and civil war left the city in need of reconstruction. 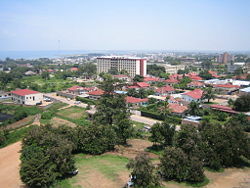 Bujumbura is Burundi's largest city and its administrative, communications, and economic center. A manufacturing center, its products include textiles and soap. Bujumbura, situated on the northeastern shore of Lake Tanganyika, is Burundi's main port and ships most of the country's chief export, coffee, as well as cotton, animal skins, and tin ore. In 2006, the last remaining Hutu rebel group signed a peace agreement with the Burundi government, bringing with it the hope that the nation's leaders would be able to focus on promoting unity and rebuilding the country. In February 2007, the United Nations officially closed its peacekeeping operations in Burundi and turned its attention to rebuilding the nation’s economy. A view of Bujumbura Beach, west of the city. Burundi, a landlocked country, lies on a rolling plateau, with Lake Tanganyika in its southwest corner. 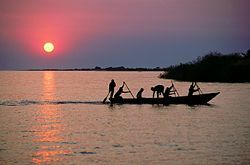 Bujumbura lies at the northeastern corner of the lake, at an elevation of 2,605 feet (794 meters). Mount Karonje, at 8,809 feet (2685 meters), lies to the southeast of the capital. Burundi has a tropical highland climate. Bujumbura's average annual temperature is 25°C (78°F), without much seasonal variation, but with slightly cooler minimums in July. Rain is irregular. Four seasons can be distinguished; the long dry season (June-August); the short west season (September-November), the short dry season (December-January) and the long wet season (February- May). Total mean annual rainfall is 33.3 inches (848 mm). Environmental issues involve soil erosion resulting from overgrazing and the expansion of agriculture into marginal lands; deforestation resulting from uncontrolled cutting of trees for fuel; and habitat loss, which threatens wildlife populations. The city center is a colonial town with a large market, the national stadium, a large mosque, and the cathedral for the Roman Catholic Archdiocese of Bujumbura. 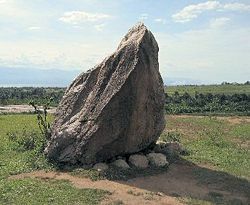 The Burundi Geological Museum is located in Bujumbura. Other nearby attractions include the Rusizi National Park, the Livingstone-Stanley Monument at Mugere 7.5 miles (12 km) south of the city, (where David Livingstone and Henry Morton Stanley visited 14 days after their first historic meeting at Ujiji in Tanzania), and the source of the southernmost tributary of the Nile, described locally as the source of the Nile. The monument where Dr. David Livingstone and Henry Morton Stanley met. 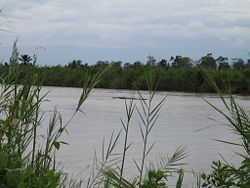 Hippopotami in the Ruzizi River in Burundi. Archaeological evidence shows that a pygmoid hunter gathering tribe, the Twa, settled the Burundi region in 70,000 B.C.E. Approximately 5,000 years ago, the Hutu, a Bantu-speaking people from the mountainous regions of central Africa, immigrated and provided Burundi's first language. The Hutu served as the main farming group in the country. The Tutsi tribe, decedents of Nilo-Hamitic-speaking people from Ethiopia, settled the region in the late fifteenth century. The Tutsis introduced agricultural techniques, and established a feudal system within local chiefdoms. The Tutsi's relationship with the Hutu remained stable during this period, and Burundi's kingdom expanded. From the beginning of the seventeenth century, the Tutsi dynasty reigned over Burundi until the late nineteenth century. King Mwezi IV reigned from 1852 to 1908, during which time he allied with the Germans in order to control his opponents, two chiefs named Maconco and Birori, who sought to seize Burundi's throne. Bujumbura became a military post in German East Africa in 1889, and grew from a small village. The kingdom of Burundi became a German colony in 1899. On December 12, 1912, Burundi became a part of the Catholic Vicariate of Kivu. After being defeated in World War I (1914-1918), Germany handed control of Burundi to Belgium, and Bujumbura was made the administrative center of the Belgian League of Nations mandate of Ruanda-Urundi. The Belgians allowed Ruanda-Urundi to continue the kingship dynasty. On October 4, 1943, power was split. Chiefdoms were in charge of land, and lower sub-chiefdoms were established. Native authorities also had powers. 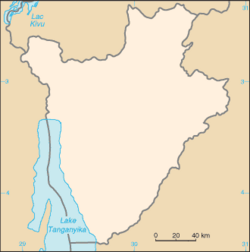 After World War II (1939-1945), Ruanda-Urundi was a United Nations Trust Territory under Belgian administrative authority. On January 20, 1959, Burundi's ruler Mwami Mwambutsa IV asked the Belgian Minister of Colonies to separate Burundi and Rwanda, and dissolve Ruanda-Urundi. The African National Union of Ruanda-Urundi (UNARU) was formed six months later to push for independence. Friction between the Hutu and Tutsi tribes heightened. In November 1959, a dispute over land sparked a clash in Rwanda between Hutu teachers and Tutsi soldiers. Tutsi refugees began to enter Burundi, fleeing ethnic persecution in Rwanda. The Union for National Progress (UPRONA), a multi-ethnic unity party led by Tutsi Prince Louis Rwagasore and Christian Democratic Party members, became popular throughout Burundi. Following an UPRONA victory in legislative elections, Prince Rwagasore was assassinated in 1961 by a Greek national named Georges Kageorgis. Independence was achieved on July 1, 1962, at which time Ruanda-Urundi was renamed Burundi, and the capital city's name was changed from Usumbura to Bujumbura. Mwami Mwambutsa IV (1915-1966) was named king. Since independence, Bujumbura has been the scene of frequent fighting between the country's two main ethnic groups, with Hutu militias opposing the Tutsi-dominated Burundi army. In May 1965, the first post-independence elections were held. The Hutu candidates scored a landslide victory, capturing 23 seats out of a total 33. Instead of a Hutu prime minister being appointed, Tutsi King Mwambutsa IV appointed a Tutsi, who was assassinated that year, sparking a series of Hutu revolts and subsequent governmental repression. Meanwhile in Rwanda, Tutsis were being killed by a Hutu nationalist regime. Burundi's Tutsi-controlled military and police forces became committed to ensuring the country's Tutsis would not meet the same fate. Unlike Rwanda, which allied itself with the United States during the Cold War, Burundi became affiliated with China. In 1966, King Mwambutsa IV was deposed by his son, Prince Ntare V (1947-1972), who himself was deposed by his prime minister Captain Michel Micombero in the same year. Micombero abolished the monarchy and declared the nation a republic. A de facto military regime emerged and civil unrest continued throughout the late 1960s and early 1970s. In late April 1972, a Hutu attack in the south of the country, where most military officers were born, triggered a systematic military repression. About 200,000 Hutus are believed to have perished within a period of three months all over the country. In 1976, Colonel Jean-Baptiste Bagaza took power in a bloodless coup. Although Bagaza led a Tutsi-dominated military regime, he encouraged land reform, electoral reform, and national reconciliation. In 1981, a new constitution was promulgated. In 1984, Bagaza was elected head of state, as the sole candidate. Bagaza's human rights record deteriorated as he suppressed religious activities and detained political opposition members. A young boy in a dugout canoe stares back on to the beach at Saga Plage on the outskirts of Bujumbura, 2006. In 1987, Major Pierre Buyoya overthrew Colonel Bagaza. He dissolved opposition parties, suspended the 1981 constitution, and instituted his ruling Military Committee for National Salvation. During 1988, increasing tensions between the ruling Tutsis and the majority Hutus resulted in violent confrontations between the army, the Hutu opposition, and Tutsi hardliners. An estimated 150,000 people were killed, with tens of thousands of refugees flowing to neighboring countries. Buyoya formed a commission to investigate the causes of the 1988 unrest and to develop a charter for democratic reform. In 1991, Buyoya approved a constitution that provided for a president, a non-ethnic government, and a parliament. Burundi's first Hutu president, Melchior Ndadaye, of the Hutu-dominated Front for Democracy in Burundi (FRODEBU) Party, was elected in 1993, but was assassinated by the Tutsi-dominated armed forces in October of that year. The country plunged into civil war, which killed tens of thousands of people and displaced hundreds of thousands by the time the FRODEBU government regained control and elected moderate Hutu Cyprien Ntaryamira president in January 1994. Nonetheless, the security situation continued to deteriorate. In April 1994, President Ntaryamira and Rwandan President Juvénal Habyarimana died in a plane crash. Their deaths sparked the Rwandan genocide, and exacerbated violence in Burundi. Fellow Hutu Sylvestre Ntibantunganya was installed to a four-year presidency on April 8, but the security situation further declined. The influx of hundreds of thousands of Rwandan refugees and the activities of armed Hutu and Tutsi groups further destabilized the regime. On July 25, 1996, the government was overthrown in a coup led by Buyoya. The civil war continued, despite international efforts to create a peace process. A power-sharing government was created in 2001, and in 2003, Hutu vice-president Domitien Ndayizeye became president. 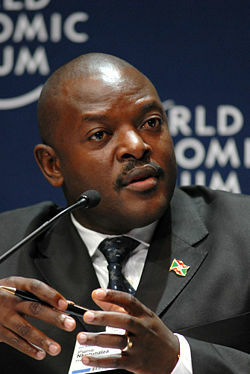 Pierre Nkurunziza was elected president of Burundi in 2005. A series of elections, held in mid-2005 were won by the former Hutu rebel group, the National Council for the Defense of Democracy. Pierre Nkurunziza was elected president unopposed by members of parliament (acting as an electoral college) on August 19, 2005. In 2006, the last remaining Hutu rebel group signed a peace agreement with the Burundi government, bringing the hope that Burundians would rebuild and be able to promote unity throughout the country. In February 2007, the United Nations officially closed its peacekeeping operations in Burundi and turned its attention to rebuilding the nation’s economy. Meanwhile, an organization known as SOS Children claimed success in the use of anti-retro viral drugs and condoms to combat AIDS. Sample testing showed that the number of those who were HIV positive was 20 percent. The death toll due to AIDS has still been devastating with the U.N. estimating 25,000 deaths in 2001, and Oxfam estimating 45,000 dead in 2003. Burundi is a republic. The president, who is elected by popular vote to a five-year term and is eligible for a second term, is both the chief of state and head of government. The bicameral parliament consists of a national assembly with a minimum of 100 seats, of which 60 percent must be Hutu and 40 percent Tutsi, with at least 30 percent being women, and with additional seats appointed by a National Independent Electoral Commission to ensure ethnic representation. Members are elected by popular vote to serve five-year terms, with remaining seats assigned to ethnic groups and former chiefs of state. Burundi is divided into 17 provinces, 117 communes, and 2638 colonies. The market in central Bujumbura. Burundi is a landlocked, resource-poor country with an underdeveloped manufacturing sector. More than 90 percent of the population are dependent upon subsistence agriculture. Coffee and tea exports account for 90 percent of foreign exchange earnings. The ability to pay for imports rests on weather conditions and international coffee and tea prices. Per capita GDP was estimated at US$400 in 2007. Bujumbura is Burundi's main port and ships most of the country's chief exports, coffee and tea, as well as cotton, skins, and tin ore. Livestock and agricultural produce from the surrounding region are traded in the city. Agricultural produce grown in the surrounding area includes bananas, cassava, beans, corn, wheat, and cotton. The city's industry involves textiles, soap, leather, paper, chemicals, and agricultural products. Bujumbura is where much of the Disney movie George of the Jungle is supposed to take place, although the film's location bears very little resemblance to the real city. Roads connect the city to cities in the Congo and Rwanda. Ferries sail from Bujumbura to Kigoma in Tanzania, while the city is also home to the Bujumbura International Airport. 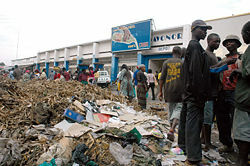 Bujumbura had an estimated population of 300,000 in 1994. Regarding Burundi's ethnic composition, Hutu (Bantu) make up 85 percent of the population, Tutsi (Hamitic) 14 percent, and Twa (Pygmy) one percent. There were 3,000 Europeans, and 2,000 South Asians living in the country in 2008. Kirundi and French are both official languages, while Swahili is spoken in the Bujumbura area. Christians make up 67 percent of the population (Roman Catholic 62 percent, Protestant 5 percent), those adhering to indigenous beliefs make up 23 percent, and Muslims comprise 10 percent. The city is home to the University of Bujumbura. Its facilities are deteriorating and significantly damaged due to an ongoing civil war. In its infancy, it was owned and operated by the Roman Catholic Church. Its 2008 enrollment was approximately 3,124. It focuses on training personnel required by the civil service. Karyenda drums from Gitega, Burundi. Bujumbura was a small village in 1889, when it became a military post in German East Africa. The city was under Belgian control before Burundi achieved independence in 1962. Years of violence between the Hutu and Tutsi tribes, which later escalated to genocide, have left the city in need of reconstruction. Bujumbura was not the original seat of power. It has had a relatively brief history through the colonial period, through the struggle for independence, and during the quest to achieve political stability. In March 2007, Burundi President Pierre Nkurunziza announced plans to move the capital from Bujumbura to Gitega, a city located in center of the country in the province of the same name. Gitega's central location was seen as an ideal place to better serve the majority of the Burundi population. The move would also re-unite Burundi with it's pre-colonial traditions. Gitega is the location of Karyenda drum sanctuaries, a tight network of mythically high places and the center of political and religious power in pre-colonial Burundi. There are those who view the proposed move as a bid to improve the legitimacy of Hutu rule, since the sanctuaries were guarded mainly by Hutu families. In the event the proposed move to Gitega takes place, Bujumbura, as the country's largest city, communications center, port, and economic center, will retain national importance. Appiah, Anthony, and Henry Louis Gates. 1999. Africana: The Encyclopedia of the African and African American Experience. New York: Basic Civitas Books. ISBN 9780465000715. Dickerman, Carol Wilson. 1983. "The founding of Bujumbura." Culture Et Société : Revue De Civilisation Burundaise. (6): 35-65. OCLC 40185451. Dickerman, Carol Wilson. 1988. Urban housing and land markets: Bujumbura, Burundi. Madison, WI: Land Tenure Center, University of Wisconsin-Madison. OCLC 19368406. Eggers, Ellen K., and Warren Weinstein. 1997. Historical Dictionary of Burundi. African historical dictionaries, 73. Lanham, Md: Scarecrow Press. ISBN 9780810832619. Encyclopaedia Britannica. 2008. Bujumbura. Retrieved August 12, 2008. Nkolo, Antoine. 2002. "Bujumbura: gateway to Africa's Switzerland." Selamta. 19. OCLC 174115565. World Fact Book. 2008. Burundi. Retrieved August 12, 2008. All links retrieved December 20, 2016. This page was last modified on 21 December 2016, at 15:54.